In Candomble, it is very common for an abiyan to belong to a terreiro for years before they become an initiate. There are several factors that lead to prolonged periods of being an abiyan, but the takeaway is that abiyans understand that there’s no rush. Afterall, good abiyans make great Iyawos, and great Iyawos make excellent Egbomis; slow and steady wins the race. If you’re interested in getting involved in Candomble, it’s important that you also begin to internalize how long your journey may be. 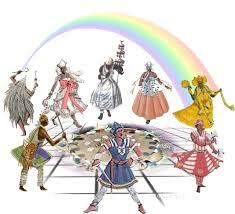 There is a lot to learn and observe as an abiyan: cooking basic foods, basic dances for Orisha, basic songs, etc. There are a million unwritten rules in Candomble, and the abiyan period is the perfect time to begin to absorb some of them. When you begin to frequent a house and eventually become an abiyan in the terreiro, you are being protected and guided by the Orisha of the house. If the universe needs to send advice your way, it will come from the mouth of the Orisha of the house. If you need to seek support, you’ll go to the feet of the Orisha of the house. At this stage, you’re learning how to interact with Orisha. You are learning about the essence of Orisha in general as an abiyan; you learn bits and pieces about each Orisha because you regularly observe their worship and praise as a member of the ile. As a Iyawo, you become a specialist in the Orishas that walk with you individually. The 7-year period provides ample time to learn prayers, foods, dances, clothes, etc. that are specific to your Orisha. Because we have this time carved out in our journey, there’s no rush to begin focusing on those things as an abiyan. Your time as an abiyan is precious to begin to understand, among other things, whether or not you want to go on the journey. It’s likely and probable that your Baba or Iyalorixa will be able to see which Orisha rules your head during preliminary readings for you, but that doesn’t mean they will share that information. There’s no secret, and not sharing doesn’t mean it’s not important information. However, it’s also not high priority during the beginning stages of your journey. In fact, sitting at someone’s table for a reading and asking about your Orisha may be a sure sign to them that you’re not interested in a journey at all. For now, work on strengthening and praising your Ori – the true owner of your head. See also: Getting Involved in Candomble Parts I and II.